If you’re a fan of pop and like it with a splash of healthy goodness, ginger beer should be on your radar. Yes, we all know ginger is packed with health benefits, but soda isn’t usually. However, if you brew your own ginger beer, your concoction will come chock full of ginger’s boosters—and we’re not just talking bubbles. Because ginger hangs out among the elite superfoods, the fermented version also sits at the same lunch table—if done right. Though technical studies have not been specifically geared toward ginger beer, it is widely accepted that the libation—when prepared with the integrity of the main ingredient in mind—packs the numerous health benefits attributed to the eponymous root. Small-batch and homebrew ginger beer recipes ensure the positive effects of consuming the herbaceous root are not offset by a slew of common additives like “high fructose corn syrup,” “sodium benzoate,” “caramel color” or “ester gum” that find their way into many nationally distributed brews that lean toward a sweeter, fruity flavor and require chemicals to make a shelf-stable product. Liliana Ruiz-Healy, whose background is in culinary nutrition, integrative health coaching and plant-based and raw cooking, notes the root helps to warm the stomach and spleen, improves digestion and appetite, and relieves nausea and gas. Ginger has been used at high doses as a blood thinner, boosting circulation and lowering high blood pressure; and a poultice to help with burns, she says. Like Mary Poppins said, a spoon full of soda helps the medicine go down … did we get that right? Well … you get the picture. And although ginger beer is best known for its starring role in the Moscow Mule—a cocktail of vodka, ginger beer and lime juice traditionally served in a copper mug—today’s fans know that this punchy libation’s warm flavor profile lends to a mélange of concoctions with or without alcohol. Here are two ways to achieve your own zesty healthy beverage. With ginger beer, the controlled spoilage creates fermentation very similar to that of kombucha.. By the way, it’s also alcohol-free. The first step is to propagate a “starter” culture. 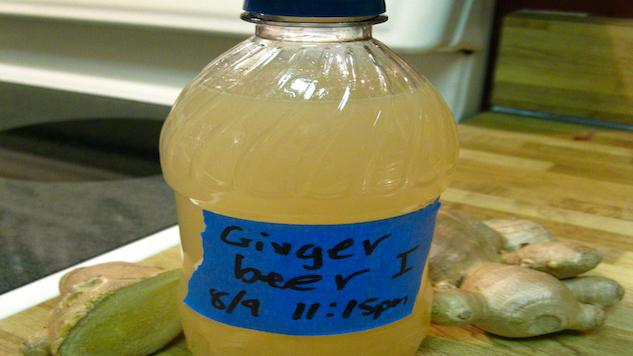 “When making ginger beer, you combine ginger, sugar, water, wild yeast and bacteria to make what is called a ‘ginger bug,’” says Dylan Lintern, C.O.O. of NOLA Brewing Company. Pour into a jar and cover with a breathable cloth. Let this mixture hang out in a warm space for about four days. (You want it to look alive, but be aware, any longer and you will eventually make alcohol). Continue to feed the ginger bug daily with an additional 1 tbsp. of grated ginger and 1 tbsp. sugar. Then, you make the drink (2 liter soda bottle). Boil water on stove top and add peeled ginger root plus any other flavors that you want in your final product. Reduce liquid by about half and strain. Add sugar and stir until dissolved. Chill to at least room temperature or until you are ready to brew. Combine chilled ginger mixture with remaining room temperature water and lemon juice. “And that is all. Now it is just a waiting game. Once in a bottle, the mixture sits anywhere from 4-10 days while the sugars are being eaten,” says Lintern.